Buzzy is an award-winning physiologic pain blocker. 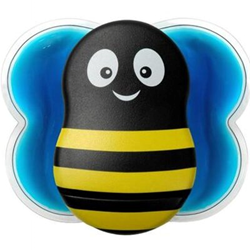 Using cold and vibration, Buzzy is proven to naturally block unpleasant sensations on contact. Pediatric emergency MD Amy Baxter invented Buzzy 4 Pain Relief, a cold and vibration device that controls pain on contact. Dr. Baxter's mission is to research and find a comprehensive solution to needle and injury pain. MMJ Labs LLC, the world leader in non-invasive reusable pain relief devices, today announced that it has received 510(k) clearance from the U.S. Food and Drug Administration (FDA) with expanded indications for Buzzy® for the control of pain associated with injections, venipuncture, IV starts, cosmetic injections and temporary relief of minor injuries (muscle or tendon aces, splinters and bee stings). Also intended to treat myofascial pain caused by trigger points, restricted motion and muscle tension. The Company’s device incorporates high frequency vibration and a unique ice pack. Buzzy’s mechanothermal system uses patented technology to provide sensations which compete with pain nerves, providing temporary relief on contact. The new indications for control of needle procedures were supported by over 8 published clinical trials. The Company’s Buzzy technology received a CE Mark in August 2012. Clinical results for phlebotomy and vaccination injections are excellent. Amy Baxter MD, CEO of MMJ Labs said, “We are thrilled to gain FDA clearance of Buzzy’s use for injections and intravenous access. The entire Buzzy team is committed to decreasing pain in a cost-effective way to relieve the burden of pain control for hospitals and patients.” The Company’s commercialization in the U.S. and internationally focuses on needle procedures, while they continue to develop other pain relief applications for temporary relief of aches and injuries. “We have found that using two modalities to control pain is more effective,” notes Dr. Baxter. The FDA created a new classification that incorporates both therapeutic massage and ice packs subsequent to their review of Buzzy. Dr. Baxter is a speaker at San Francisco's TEDMED 2014 conference on September 11th. MMJ Labs LLC is developing the next generation of personal pain relief products. Initially for hospitals, their technologies are well suited for home enhancement of orthopedic icing and training regimens, including overuse injuries, aches, and pains. The company’s Buzzy thermomechanical patented technology provides an easy to attach vibration unit with unique solid-freezing ice pack. The patented curvature allows for greater surface contact for pain and for transmitting cold and vibration sensations directly where they are needed. More information at Buzzy4painrelief.com.